ASTANA, March 19. /TASS/. Kazakhstan’s President Nursultan Nazarbayev pointed to the need for a new generation of leaders to come to power in the country in his televised address to the nation on Tuesday. 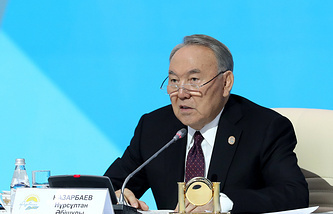 «As the founder of independent Kazakhstan, I see my future task in ensuring the coming to power of a new generation of leaders who will continue the reforms underway in the country,» Nazarbayev said in his address to the nation. He recalled that, in case of an early resignation of the incumbent president, his powers will be transferred to the chairman of the Senate until his term ends,» adding that then the country would hold the election. «We see that the world is changing. Not only new opportunities emerge, but also new global technological and demographic challenges and global instability. Each generation has to address its challenges. My generation and I have done everything we could for the country. The results are well known to you,» Nazarbayev said. According to Kazakhstan’s leader, the arrival of a new generation of leaders is a natural process. «They will be tackling the issues of their time. Let them try to make the country even better,» the president stressed.